Polenta, ricotta, honey, and figs. These are the key ingredients that are in this unusual cake recipe. I don’t think I ever would have made this recipe if it weren’t for this fun, baking club. I’ve never even bought or cooked (or in this case, baked with) polenta before, so it was all a big learning experience for me. I learned that cornmeal and polenta are the same thing except polenta is Italian. It doesn’t matter what name it is; the key is the grind. You don’t want cornmeal or polenta that’s ground too finely. Stone-ground or medium ground is best. Instant or quick cook polenta has been partially cooked and then dried and may not give the cake the right texture. Having said this, I used a package of cornmeal that didn’t state that it was medium grind or stone-ground, but it did have a grain similar to sugar, which I read was what to look for. And the polenta I used had “express” in the title, so I’m guessing it was more finely ground and upon closer inspection was more like table salt than table sugar. This difference was evident when pouring the batter into the pans. The polenta version was runnier. However, it didn’t affect the outcome of the cake. I’ve never used ricotta in a dessert before, only in lasagna! It’s an Italian whey cheese that is fresh, unripened, and uncooked. In Italy, ricotta is made from sheep or water buffalo which gives it a more earthy, nutty flavor (according to Wikipedia since I haven’t yet had a chance to try true Italian ricotta). American ricotta (and Canadian, for that matter) is milder. The color of honey comes from the nectar. The darker the color of the honey, the stronger the taste. I had two different honeys stashed in my pantry, so I decided to experiment with a clover honey (a lighter, amber color) and a buckwheat honey (a darker, stronger flavor). Of course, I had to experiment with all types of figs. I bought some fresh figs before reading through the recipe thoroughly. Oops. Luckily, I picked up some dried ones as well on my trip to the market. 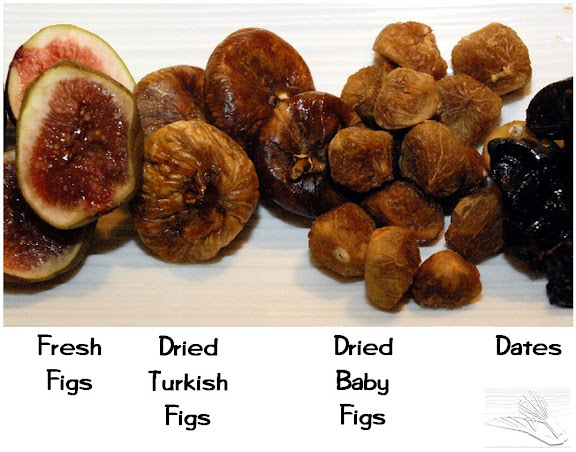 I found some baby dried figs and Turkish figs. And, since I love dates, I had to give that a try too. As for garnishes, I thought a crème fraiche with a hint of ginger and cinnamon would complement this dessert nicely. I found a recipe for crème fraiche in this article. To make crème fraiche, combine 1 cup (250 mL) of heavy 35-percent cream with 2 tablespoons (25 mL) sour cream in a glass container. Cover and stand at room temperature 24 hours, or until very thick. Stir well, cover and refrigerate. Keeps up to 7 days. I found some thick double cream as well, and in a blender threw in a couple of stem gingers and some ginger syrup, a dash of cinnamon, and a bit of leftover cream cheese frosting from last week’s Tuesdays with Dorie. This was delicious too with the heat from the stem ginger. Sprinkled with the leftover candied walnuts from last week and diced crystallized ginger, the crunchiness factor was covered. To dress up the plate, I drizzled some honey over it. As another variation, I bought some Devon cream, whipped it up, and added a few sprinkles of cinnamon and ground ginger. This turned out to be my favorite garnish. You can find the recipe for Fluted Polenta and Ricotta Cake at this blog Engineer Baker or in the book Baking: From My Home to Yours by Dorie Greenspan. To see how the rest of the TWD group fared with this week's recipe, click here and then click on each blogger! • Polenta or cornmeal. It was a tie. It didn’t matter. Although next time I would make sure to get a medium-ground polenta so that it was more batter-like and less runny. • Clover or buckwheat honey. The amber, clover honey won. The darker, buckwheat honey gave the cake a sweeter taste, but we preferred the lighter taste of the clover honey. • Fresh figs, dried figs, or dates: Fresh figs won. I liked the softness and sweetness in the fresh fig; the chewiness of the dried figs and crunch of the seeds wasn’t as pleasant. I love dates, so I enjoyed this version too. Peanut Butter Torte on pages 282-283 chosen by Elizabeth of Ugg Smell Food. Beautiful, beautiful job, Shari, as usual. And I always learn something from your posts! Wow, you really got creative! I love all the different shapes and decorations, beautiful! FAbulous job and tutorial! I love all your cakes. Well done! Absolutely beautiful. I can't even think of anything else to say. I am awed. 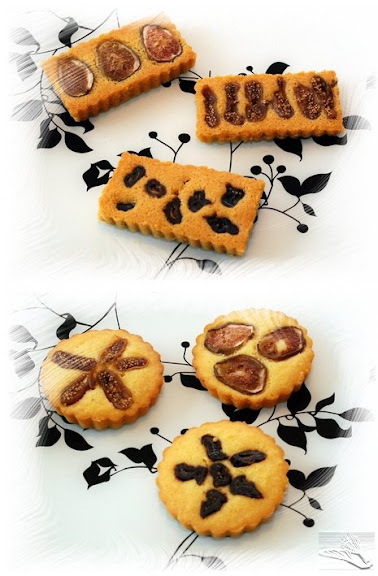 I had a lot of fun reading your write up, and the mini tarts just make me flutter. I know you had to be an A student in school because you always go the extra mile. Great job, all the pics and facts. Very interesting. What a great post! and great looking cakes! I love your comparisons! They're all so cute and beautiful! I love how you lay everything out and label it! Great job on BOTH versions! They all look amazing! Your cakes turned out lovely looking! Thanks for the great tutorial too...very informative! wow--it's like a laboratory in your kitchen! love reading about your experiments! Wow, you really do work through a recipe! A really interesting post as well as some fab photos. And, you got the figs to show! CB - thanks for the vote of confidence! Thanks again to everyone for their kind words! Shari, your posts are always so fab! 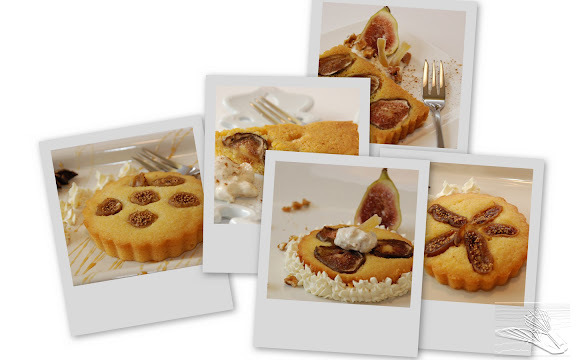 I like that you tried different types of figs, and I'm game to try your fresh fig version in the future! The ginger-cinnamon whipped cream sounds good too, well done!!! This post was awesome! I enjoyed the pictures of your little cakes, and the tutorial was highly informative. Thanks for the lesson! Woah....amazing! I'm definately nominating you for the secret ingredient thing if they ever put it up! Great photos! I've always thought that polenta refers to the dish that you make with cornmeal, where you add water and boil it all together. I love the three honey photos stacked together. Gorgeous! Actually, in Italian "polenta" is the name of the cooked dish, while "farina di mais" (or "farina di granturco") means "cornmeal."